Comodo launched a few days ago the latest verion of their free internet security solution-3.10. 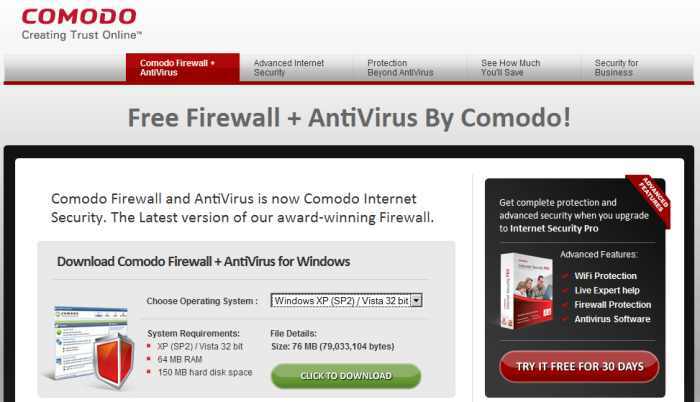 The only solution so far that offers an antivirus and a firewall in the same package, Comodo Internet Security 3.10 includes new features and services, as Comodo Secure DNS and Comodo HopSurf. It includes also a memory scan moduleÂ and keylogger blocking module. So far we couldn’t get it to run properly on Windows 7, but if you use XP or Vista, this one is for you. It’s easy to install and use and offers many more features than other free software in this area. Recommended. Posted in	System utilities. Tagged with	antivirus, comodo antivirus, comodo antivirus & firewall, comodo antivirus and firewall, comodo tips, firewall, free internet security, free software, Freeware, freeware antiviras 2011, freeware antivirus and firewall windows xp, freeware comodo antivirus and firewall, freewaretips, freewaretips.info, grundig satellit 800, home users, how to scan antivirus with comodo antivirus and firewall, internet security solution, internet security suite, memory scan, raquo, scan module, security solution, verion, why is comodo is blocking cnn. Networx-bandwidth monitor	Paint.net – very good photo editor, and more!